OAKLAND — Former Your Black Muslim Bakery leader Yusuf Bey IV and co-defendant Antoine Mackey will likely seek a change of venue next month for their upcoming triple murder trial, lawyers in the case said Monday. Alameda County Superior Court Judge Morris Jacobson set a hearing on the matter for June 21 during a brief hearing. No motions have been yet filed. “We are exploring it,” Bey IV’s lawyer, Gene Peretti, said. Neither Bey IV nor Mackey appeared in court. 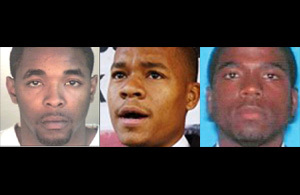 Bey IV faces three counts of murder. He is charged with ordering the killings of journalist Chauncey Bailey and two other men in the summer of 2007. Mackey is charged with helping admitted gunman Devaughndre Broussard carry out two of the killings and committing the third himself. Prosecutor Christopher Lamiero said “there could be live testimony” at the hearing and its potential length would not be known until it is clear how much evidence defense lawyers want to present. The trial is scheduled to begin Aug. 2 with motions and jury selection. Peretti, who was assigned to represent Bey IV last month after two other lawyers dropped out of the case, said he was not yet certain whether he will seek a delay. “There is a lot of material,” he said outside of court. Bey IV also is being investigated on suspicion of ordering witnesses in the case killed. Gary Popoff, one of his former bodyguards, was jailed for violating parole after a Department of Corrections hearing officer found he conspired with Bey IV and was planning to carry out the hits. He is facing criminal charges. According to a summary of Popoff’s parole revocation hearing, he was found in possession of a trial transcript on which Bey IV had handwritten notes while in jail. Lorna Patton Brown, Bey IV’s former lawyer, is also being investigated. The parole summary states that she gave the transcript to a Bey family member who gave it to Popoff. Lamiero declined to comment on the investigation Monday.